Nathaniel Borden was born September 22, 1932 in Detroit and grew up in Jersey City. A solidly built athlete with great speed and coordination, Nate played football as a boy and joined the track team at Dickinson High as a teenager. He was an All-State pick at fullback and also played the line. He specialized in the shot put and discus. Nate accepted a footballs scholarship from Indiana University, where he played defensive tackle and defensive end and never missed a game. The Hoosiers’ football program was at a low ebb during the early 1950s; the team went 9–27 during his four varsity seasons. Nevertheless, Nate played well enough against Big Ten opponents to catch the eye of NFL scouts. He was smallish at 6’ but moved his 240-pound frame quickly enough to be a good run-stopper. He was selected by the Green Bay Packers with the 293rd pick in the draft. Nate was one of the first African-Americans to play for the Packers. Many of his teammates were Southerners and were unhappy that he made the team. When he tried to rent a motel room for the season, other players staying at the property forced the manager to turn him away. He ended up living with his family in a ramshackle structure outside of town. Bart Starr, an Alabaman who joined the Packers in 1956, reached out to Nate and often had his family over for dinner. Nate started a handful of games at defensive end for the Packers in 1955 and recovered three enemy fumbles. He won the position outright a year later and was a key player for the club through the 1959 season, when he was slowed by a knee injury. The Packers left Nate exposed in the expansion draft and he was picked up by the Dallas Cowboys. He started at left defensive end in 1960 and moved to the right side in 1961 to accommodate rookie Bob Lilly. 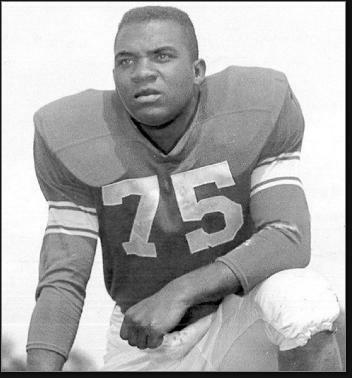 Nate played in 1962 as a sub for the AFL Buffalo Bills and saw time with the CFL Toronto Argonauts in 1963 before being given his final release. Nate had an eye for talent and had actually done some off-season scouting while with the Cowboys. After his playing days, he scouted for several clubs, including the Packers, Falcons and Bengals, as well as the World Football League in the 1970s. Nate moved to Las Vegas in his 50s and worked as an assistant to City Manager Russell Dorn, and also worked in the city’s Urban Development office . He passed away in 1992 from cancer at the age of 60.